by Darcy Menard of stumblinghomestead.com. Stumbling Homestead is a blog and weekly podcast about family homesteading and the role of kids in raising cows and chickens, composting, gardening, and food production. 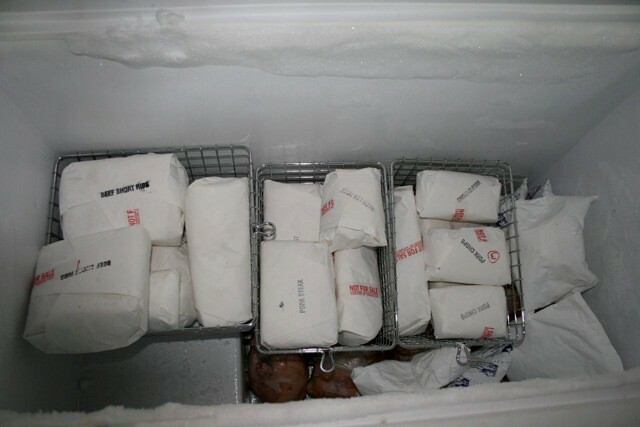 Note From Nick LaDieu: I just got a 15 cubic feet chest freezer, thanks for the timely article! 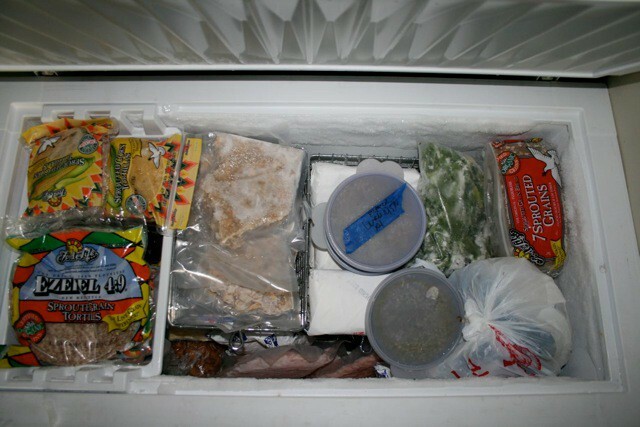 Our family stores a variety of foods in our chest freezer: our cow and pig shares, seafood, chicken, blanched vegetables, cheese, nuts, tortilla shells, etc. Up until recently, it’s been a jumbled pile of disorganization that often left us unsure about what was inside. Also, to get something out requires digging through a shifting pile of frozen items until our hands are numb. And, unless you want to lay out the contents of the freezer on the floor, you’re never sure if you don’t have the item, or just can’t find it. But an even bigger problem for me was a potential power outage. Sure, we’ve got a generator standing by for that eventuality, but what if that fails for some reason? Or what if the freezer breaks down? 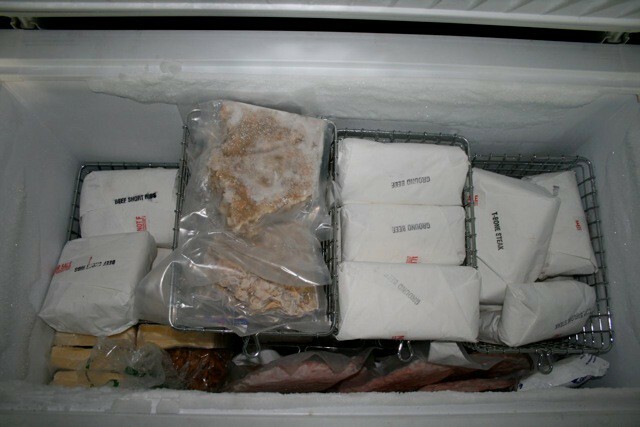 Even if things started to only partially thaw, there’s the potential to have chicken or pork blood contaminate the other items. And I don’t relish the thought of overcooking my beef or veggies just to be safe from potential pathogens introduced by chicken and pork drippings. So, I’ve been wanting to segregate my frozen foods by type for a while now. As if reading my thoughts, there was a similar listener question about chest freezer organization on a recent episode of The Survival Podcast. Jack’s answer of using baskets gave me the perfect solution to my problem of preventing drippings: the baskets allow me to stack my food in layers that puts the riskier items on the bottom. As shown in the top of this post, all chicken is on the bottom layer of the freezer. The second layer is two baskets of pork on the right. On the left, my larger beef cuts sit higher up on the shelf over the freezer motor. I also filled in the gaps with cold packs. No risk there. The third layer is another 3 baskets of beef cuts, ground beef, and seafood. I used the remainder of the raised shelf space for cheese, and nuts, and put some frozen shrimp into the gap at the front. All of these items are safely above the potential drip zone. Finally, the top layer is the removable tray, which holds miscellaneous items like tortilla shells. I also put vegetables, other seafood, and bread on this top layer. It’s hard to tell from the pictures, but this makes it much easier to get at things on the bottom. All I have to do is remove a basket or two. And not only do I now have a risk-free segregation of my food, but I now know where everything is, and how much of everything I have. Thanks for the idea Jack. I’m guessing that you know someone who has suffered through a digital disaster such as loss of precious family photos or important tax documents and other files. Just like you prepare for other disasters n the physical word you need to be digitally prepared. The first step towards digital preparedness is creating a good backup scheme for your important files. I have a good friend who recently had all of her interior design business’ documents on a laptop. I didn’t know this was the case until it was to late. In her case she didn’t drop it in a puddle or experience hard drive failure. On new year’s eve this past year her house was broken into while she was away and the laptop was stolen. Laptop lo-jack and encryption of sensitive information is a topic for another thread. Those issues aside, she experienced the loss of many digital assets including quick-books financial records and irreplaceable photos which were both business and personal in nature. This is not a threat on the level with a physical threat to your safety but I assure you it is a real threat and if you go through it you will highly regret not being prepared. People regularly pay upwards of $5000 for hard drive recovery services to retrieve family photos, make sure that doesn’t happen to you.